"Neutrality is not a possibility." 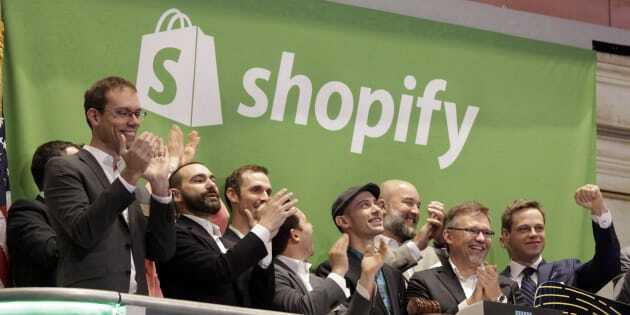 Shopify CEO Tobias Lutke, center wearing hat, rings the New York Stock Exchange opening bell, marking the Canadian company's IPO on May 21, 2015. Shopify is taking aim at weapons companies by banning the sale of some firearms and accessories on its platform. iTORONTO — Shopify is taking aim at weapons companies by banning the sale of some firearms and accessories on its platform. The Ottawa-based e-commerce giant quietly made changes to its policies this week to keep its merchants from using its technology to sell everything from semi-automatic firearms that accept detachable magazines to accessories including grenades, rocket launchers and flash and sound supressors. The company did not elaborate on why it changed its policy or how soon gun-sellers will have to vacate the site in a statement provided to The Canadian Press, but said the changes are part of regular reviews and amendments the company does to its terms and teased that it "may further refine our policies as needed." The changes have angered at least one gun manufacturer, who relies on the site for its online presence. Florida-based firearm-maker Spike's Tactical, which sells over 1,300 firearms-related products, said it runs its entire online operations through Shopify and claims to earn millions of dollars in sales through the platform every year. Its general manager Cole Leleux said the move will have "significant ramifications" because Spike's Tactical will now have to find a new platform to use for its online sales. "To take someone's money and agree to services and then change your policy that dramatically overnight, potentially costs a bunch of businesses and people's jobs. It's just wrong," he said. "We have about $100,000 wrapped up in our website and I expect we will have to invest that in a new business. We are a big enough company to absorb that, but there are a lot of smaller companies that will not be able to." He said he is frustrated because the company notified him about the changes in a email, but has not provided clarity on how soon his business has to stop selling firearms through the platform. So far, he said one company representative told him a timeline has not been established yet for the changes. Leleux is also upset with Shopify founder Tobi Lutke, who has previously spoken out in favour of free speech, but backtracked on that sentiment on Monday when he posted a blog about policy changes, saying that the company's policy now "allows space for all types of products, even the ones that we disagree with, but not for the kind of products intended to harm." Lutke's post says that Shopify has found that the legislative process is "no match for the realities of the internet" and as a result, the company has had to accept that "neutrality is not a possibility." Leleux called Lutke "hypocritical" and said he thinks the gun ban is not really about Shopify taking products that can cause harm off the platform, because he said guns sold on the platform go through all the same checks as those sold in-person. Whenever a customer orders a weapon from Spike's Tactical online, Leleux said it triggers a system that requires the weapon to be shipped to a federally-licensed firearms dealer close to the buyer who is required to do a full-background check on the buyer. Leleux alleges that Shopify's choice to remove guns from the platform isn't really about safety, but about the company removing items it disagrees with and furthering its own political agenda. "The best analogy is sugar. It is bad, it causes diabetes and it kills thousands of people every year," said Leleux. "Are they going to ban any item that contains sugar?"